First off, this course is huge! 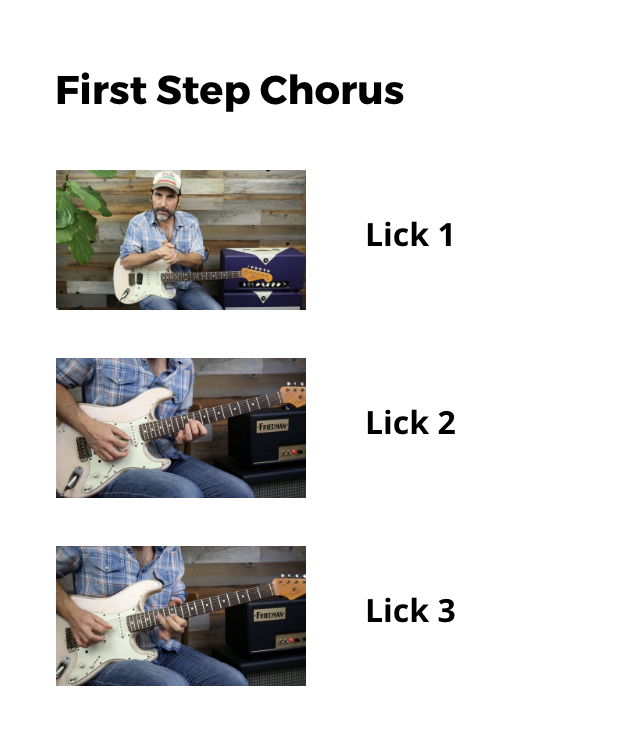 When I finished editing it I realized it was over 10 hours in length… That’s well over 600 MINUTES of how to create your own licks. I’ve broken down the course into 16 modules. We start by taking each of the minor pentatonic positions and learn how to create licks with chord tones in mind. This is where the fusion of pentatonic scale and the CAGED system comes into play. This combination of scale and the CAGED system allows to learn how play all of the pentatonic shapes as well as see your chords all over the neck aka improvising magic! All real world solos move around on the neck. You will rarely find yourself just playing in one spot. 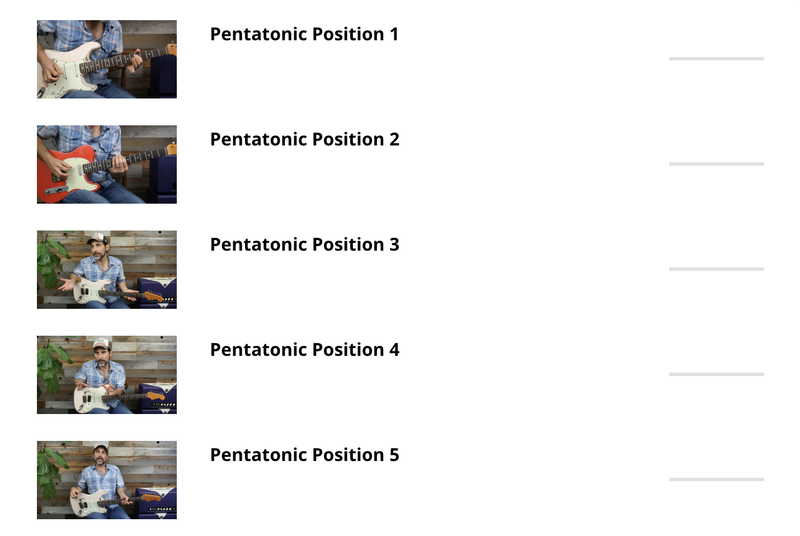 The combo module gives 5 more examples on how to connect the pentatonic positions together. I’ll give you common examples and patterns used in many of the greatest solos ever recorded. Now it is time to apply this method over different chord progressions. This is where you will finally grasp how amazing this approach to improvising is. Once you are able to apply the CAGED system to each of the chords in your progression, no matter where you are at on the neck, you will be able to spot the chord tones of the chord you are playing over. When you use these chord tones or target notes as the foundation of your phrases, you will be blown away by how much more melodic your solos will be. 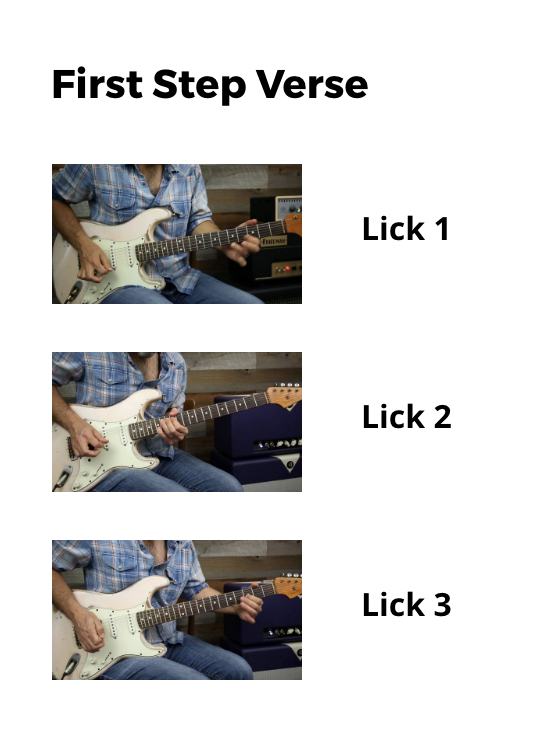 This is what all great improvisers are able to do, take their bag of licks and modify them to fit over any progression that they are playing over. Now your scales are like a road map and the target notes become the destination. I have created 5 professionally recorded jam tracks in various keys for you to solo over. 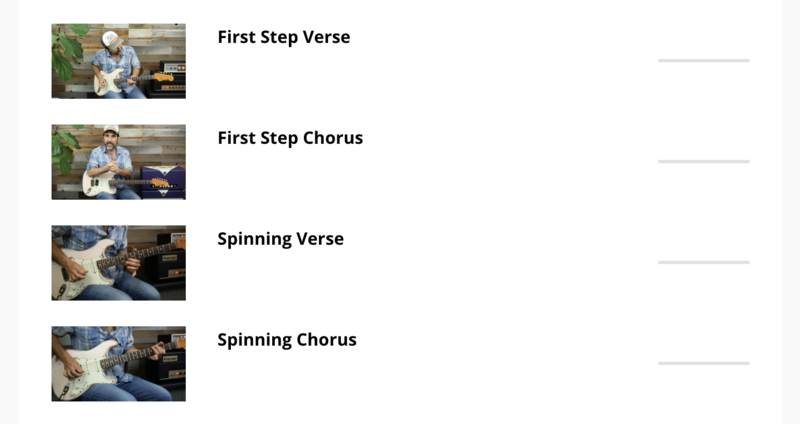 Each track contains two different progressions, a verse and a chorus. I’ve created 3 example solos for both the verse and choruses of each jam track. That’s 30 solos in all! Each solo containing numerous lick ideas within them. You will literally have hundreds of different ideas you can use to create melodic solos by the time you are done. This is where you will get a deep dive into using this system. We will take each chord in each progression and learn to design melodic phrases around them. Not only that but now we add all of the other ingredients used to make solos really stand out. You will get a crash course in how use techniques like bending, vibrato, timed vibrato, adding the blues note and other chord tones NOT in the pentatonic scale, chromatic licks, pick attack, and dynamics. These tools give your solos the sound and feel that the pros have. The combination of these things are how you get solos to emotionally connect with and drawl in the listener. Imagine a Stevie Ray Vaughan or Pink Floyd solo with no bending or vibrato!